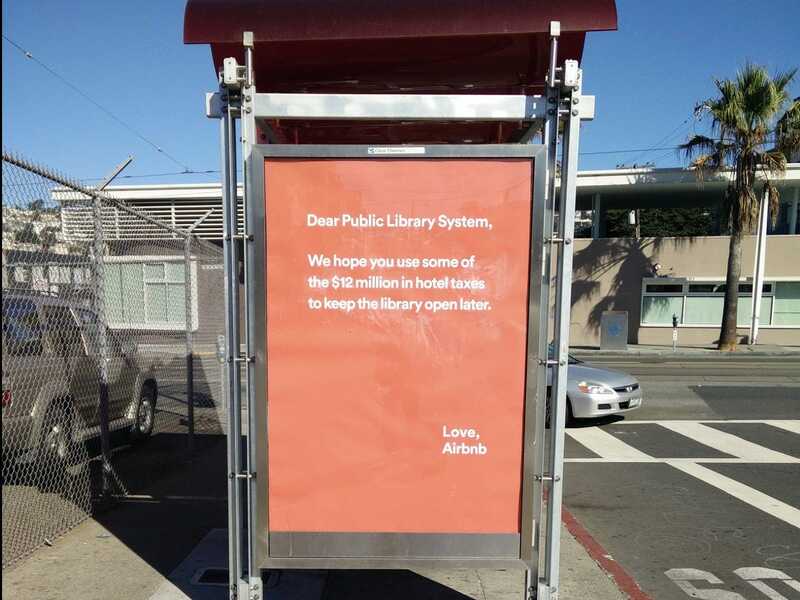 Business Insider reports on the removal of offensive ads against public libraries at San Francisco busstops. Some of the ads offended San Francisco residents. One letter to the public library system said it should be spending Airbnb's tax money on staying open later. "Had you donated that $8 million you spent fighting Proposition F directly to the public libraries you love so much, that could have made a bigger difference. Oh well. Hindsight is 20/20!" said San Francisco State University professor Martha Kenney in her Facebook post. Airbnb confirmed to Business Insider that it was taking down the ads after they were posted this morning, and that the campaign was not run using the $8 million it had given to political groups to fight proposed legislation. Buzzfeed’s business model relies on shareability, something it has in common with today’s library, which is why library website designers have the opportunity to learn from Buzzfeed’s overwhelming success. Here are the top lessons library website designers can learn from Buzzfeed. Should authors use Snapchat to target a younger audience? Teleread asks if authors should be using the Snapchat social media platform to promote themselves. Why? Oh? The exact audience that young adult writers crave." This begs the question: Should libraries be using Snapchat? Read more about Should authors use Snapchat to target a younger audience? "The lobby filled with local residents such as Amanda Efta, who carried her nephew Aiden Kolanizios. A library trustee offered green cupcakes to visitors. “This is the biggest crowd the library’s seen in a while,” Northlake Mayor Jeff Sherwin said. As the sheet was removed from the statue, people applauded, cameras clicked and little kids gazed up or rubbed the big toe — about the size of a grapefruit." What. Will. You. FIND? NYPL Trailer for their Local History & Genealogy Dept. "History has secrets, but secrets don't stay hidden if you know where to look": a video by the Milstein Division of the NYPL: click to view. More about the video's creation here. Read more about What. Will. You. FIND? NYPL Trailer for their Local History & Genealogy Dept. UK author Julia Donaldson has penned a poem in protest at planned library closures. The writer, who was named Children's Laureate and awarded the MBE last year, said she had used libraries since she was a child and still visited her local branch to research and write her best-selling books. Her poem, released on Friday to mark National Libraries Day, describes them as places to "meet your heroes, old and new, from William the Conqueror to Winnie the Pooh". The 62-year-old writer, who was born in London but lives in Glasgow, said she wanted to make a serious point in a fun way. She said: "It's just more interesting to put the reasons I love libraries in that form rather than write an earnest article about it. If we lose libraries, we would lose readers and we would become a less literate country." Campaigners say hundreds of libraries face closure, with some groups taking legal action in a bid to save them. Her Library Poem reads: "Everyone is welcome to walk through the door. It really doesn't matter if you're rich or poor. There are books in boxes and books on shelves. They're free for you to borrow, so help yourselves. "Come and meet your heroes, old and new, from William the Conqueror to Winnie the Pooh. You can look into the Mirror or read The Times, or bring along a toddler to chant some rhymes. PALM COAST, Florida -- These days it seems everybody's trying to make a buck, including public libraries. And library officials are coming up with some creative ways to do just that, such as handling passport applications and adding merchandise sales and cafes. Long-range plans at the Flagler County Library in Palm Coast call for creating an inviting atmosphere for patrons, with a coffee shop serving as the centerpiece. Officials also hope leasing floor space to a vendor will provide a little extra cash for the library. "We want people to be relaxed and feeling good," said library director Holly Albanese. "People like to have a cup of coffee when they sit and read the newspaper or the first chapter of a book. We want them to be able to do that here." Incorporating a casual café into the traditional public library mission of lending books, providing meeting rooms and offering classes to the public is part of a national trend, according to a study by the Primary Research Group, a private marketing company. "Even the places that don't currently have one (a café) are looking to do it in the future," said Marcia Warner, president of the Public Library Association, a division of the American Library Association. "We're kind of johnnys-come-lately. Museums have been doing this for a lot of years." More ideas for selling your library at the Lib Success Wiki.